We recently when to the ROM where we were delighted to see an exhibit on the Trypillian culture, a mysterious culture from about 4500 BC in the Urkraine. They had some odd habits (burning their settlements, no burials found, large societies of apparently equal members) and some very mysterious symbols and artifacts. 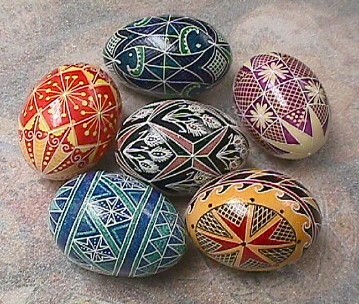 Some of these symbols are similar to pysanky (the eggs that have been decorated from the same region) although the designs may or may not have been readapted. This page has a pretty interesting In My Opinion bit on the religious roots of the area, with nice pics. The Trypillian culture is really cool, and their art is incredible. The 'binoculars' are really interesting. Jess the pictures of the pottery looks like the pottery one would find in the southwest. striking similarities. amen to that! neither was I at that age. but yeah that sounds like a cool place to get lost in.